A University of Ottawa professor is speaking out against a recently-launched fundraising campaign by Toronto's Hospital for Sick Kids that uses "war as a metaphor" for the experience of living with a disease. 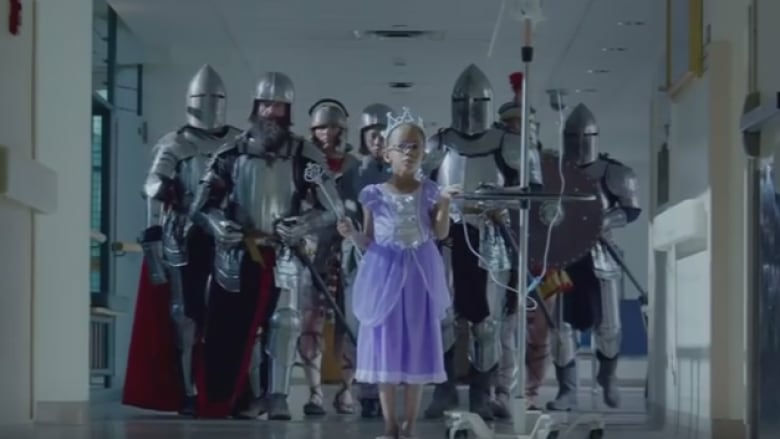 A University of Ottawa professor is speaking out against a flashy, hard-to-ignore fundraising campaign by Toronto's Hospital for Sick Kids that uses "war as a metaphor" for the experience of living with a disease. Michael Orsini, a professor in the school of political studies, recently co-authored an editorial that calls out the hospital's new four-part "VS" ad campaign, which depicts patients and former patients literally fighting back — as boxers, wrestlers and soldiers — against the illnesses they're facing. "When we talk about war and battle, there are winners and losers," Orsini told Ottawa Morning host Robyn Bresnahan on Thursday. "I think [the campaign] leaves out the folks who are so-called 'brave soldiers' who cannot win the war, win the fight. And that is really kind of unfortunate." Set to the pulsing beats of the song Undeniable by rapper Donnie Daydream, "VS" depicts hospital patients kicking, punching and swinging baseball bats against adversaries like cancer, kidney failure and cystic fibrosis. The hospital was keenly aware the $2-million ad campaign could court controversy, however. Earlier this month, hospital foundation CEO Ted Garrard told CBC News he hoped the ad would "jolt" viewers out of their complacency. "The most important thing is you think twice about it," Garrard said. "What we are hoping is, even if people find it uncomfortable, they will say, 'OK, why are they doing this? What's the story they are trying to tell?'" "We want to jolt people on the sidelines people who would not have thought of getting involved with Sick Kids before." But the "very violent images" and the use of "war as a metaphor" for children's experience with disease, said Orisini, was what compelled him and University of Toronto professor Anne McGuire to write their opinion piece against the campaign. The piece was published Oct. 19 on Impact Ethics, a website managed by researchers at Dalhousie University in Halifax that describes itself as a "forum for discussion of and commentary on bioethical issues." "I have no right to tell someone that what they're fighting is not a battle, but I do think that framing this [with] violent imagery is quite another thing altogether," said Orsini, who also studies health policy and disability at the U of O. "The point is to sort of begin from the perspective of folks who are living with these conditions, and that means there's a variety of human experience. That variety, for me, is not represented." Orsini also said he had problems with the fact that the ad campaign also includes autism as one of the adversaries. "Autism is not a disease in the way that we think about the diseases that are summoned in this campaign," he said. "For people who are autistic — autistic children, autistic adults — autism is not something they want fixed. It's not something they want to cure."